The Sorcerer's Revolt (Pingyao zhuan) is an early gods and demons novel written by Luo Guanzhong. In the story, Wang Ze begins a rebellion against the government with the aid of magic. 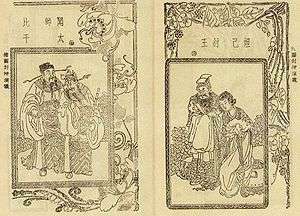 The Four Journeys (Siyouji) is another early shenmo work composed of four novels and published during the dynasty as a compilation of folk stories. The Story of Han Xiangzi (Han xiangzi quanzhuan), a Taoist novel from the same period, also shares this supernatural theme but contains heavier religious overtones. The grotesque exposés of the Qing dynasty (qiangze xiaoshuo) reference the supernatural motifs of shenmo xiaoshuo, but in the Qing exposés, the division between the real and unreal is less clear cut. The supernatural is placed outside of conventional fantasy settings and presented as a natural part of a realistic world, bringing about its grotesque nature. This trait is embodied in the Journey to the West and other shenmo parodies of the late Qing dynasty. 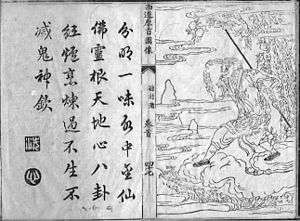 In A Ridiculous Journey to the West (Wuli qunao zhi xiyouji) by Wu Jianwen, the protagonist Bare-Armed Gibbon, a more venal version of Sun Wukong, aids the Vulture King once he is unable to wring any money out of a penniless fish that the vulture had caught and dropped in a puddle. The monkey returns in another Wu Jianwen story, Long Live the Constitution (Lixian wansui), and bickers with other characters from Journey to the West over a constitution for Heaven. The four main characters of Journey to the West, the monkey, Xuanzang, Zhu Bajie, and Sha Wujing, travel to modern Shanghai in the New Journey to the West (Xin xiyouji) by Lengxue. In Shanghai, they mingle with prostitutes, suffer from drug addiction, and play games of mahjong. Journey to the West was not the only gods and demons novel lampooned. New Investiture of the Gods (Xin Fengshenzhuan) is a parody of Investiture of the Gods by Dalu that was published as a guji xiaoshuo comedy. ↑ Chun 2011, p. 120 note 28. Yu, Anthony (2008). "The Formation of Fiction in the "Journey to the West"". Asia Minor. Academia Sinica. 21 (1): 15–44. JSTOR 41649940.